In my previous post about the Android fragmentation, I had detailed its cyclical nature, using basic statistical properties. However, the continuation of this cyclical pattern was partly dependent on the Android platform moving closer to an annual release cycle, as stated by Any Rubin. Let's take a look at why Jelly Bean's was released early and the impact this could have on Android fragmentation. This is actually fairly simple to explain. The primary reason for the early release of Jelly Bean was one word - marketing. With the Nexus 7 tablet, Google is mounting a major push into the tablet market and in order to ensure that they created enough market buzz, they felt the need to use every weapon at their disposal, including making it the first device to run a new version of Android. 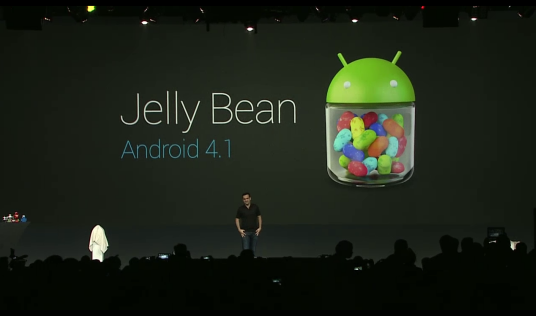 Even though Jelly Bean is basically an incremental update with few major changes, the branding power of a new Android version cannot be understated. In addition to this, Google wanted to tie up some loose ends on the performance front before starting the tablet push. 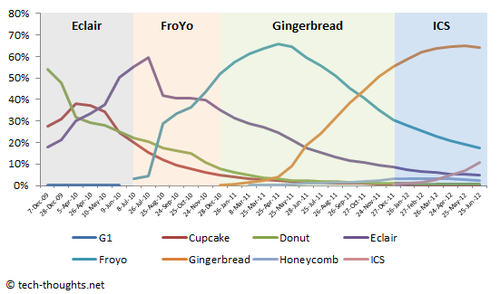 As we can clearly see, even though Gingerbread's share has started to reduce, it is still the dominant android version while ICS is yet to reach critical mass, with a penetration of 10.9%. The chart also shows that this is fairly consistent with the pace of Gingerbread's adoption into the market within the same time frame as well. As we did in my previous post, let's take a look at the current values of Kurtosis and the H-index to understand the state of Android fragmentation. Kurtosis seems to have reached its peak as ICS adoption has increased. This is natural, as ICS is currently in process of replacing FroYo on the adoption chart. 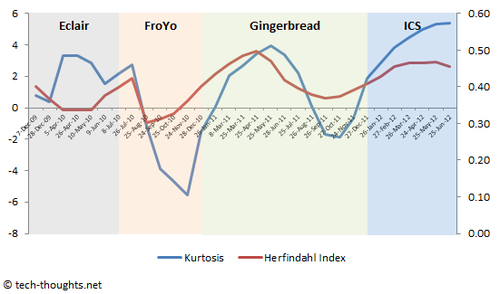 As FroYo's market penetration reduces, Kurtosis should see another fall. Kurtosis will be a cyclical pattern with a rising mean as the number of "active" android versions increases. The H-Index, meanwhile, is still following the familiar cyclical pattern between 0.33 and 0.50. This means that developers still need to focus on 2 operating system versions apart from ICS. However, the early release of Jelly Bean could throw a wrench into this, as there will soon be two "new" versions. Since FroYo's penetration has not yet reached a level that is sufficiently low, developers will need to focus on ICS and Jelly Bean apart from the two older versions and this will have a negative impact on the H-Index. The saving grace is that since Jelly Bean is merely a small incremental upgrade (primarily performance oriented), it may not be vastly different from ICS, from an app development perspective. This should also ensure that the pace of Jelly Bean adoption by OEMs is faster. Google has also released a Platform Development Kit (PDK) for OEMs that will be released 2-3 months before the release of a new Android version. This should, in theory, speed up the upgrade process from OEMs' perspective. However, the Android Upgrade Alliance was formed to tackle this problem as well, with no real results. At the end of the day, this will come down to OEM motivations. Conclusion - The early release of Jelly Bean, although necessary for Google, should have a negative impact on Android fragmentation. However, the fact that this is an incremental release and the release of the PDK for hardware partners should minimize any long-term impact.